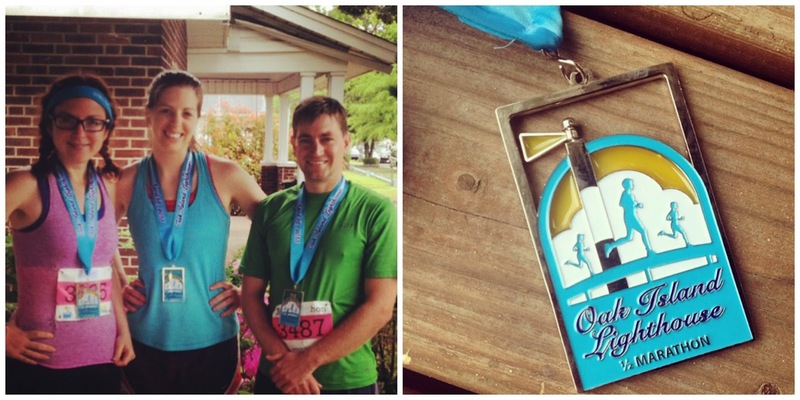 Just about a month ago, I ran the Wrightsville Beach Half Marathon and set a new PR. (Huzzah! Still excited about that.) In fact, I was so excited and felt so good that I (along with my training buddies, Katie and Nathan) decided to immediately sign up for another half marathon in April. Once my runner's high faded and the soreness set in, I began to question the wisdom of this decision. Wasn't one half marathon enough? I already PR-ed - what did I have left to prove? Can't we just stay up late and spend Sunday morning lazily drinking coffee in our bathrobes instead of going for yet another long, slogging run? Needless to say, I wasn't excited about the Oak Island Half Marathon - especially once I realized I double-booked us, and that we would be driving 3.5 hours after the race to visit friends in Winston-Salem. Skipping the race wasn't an option - I'm a stickler for following through on things, and anyway, we'd already paid the registration fees. So on Saturday, April 18th, we woke up early, drank coffee, picked up Katie, and headed south to Oak Island. Spoiler alert: it was a really fun race and I'm so glad we ran it! This race was smaller than the Wrightsville Beach race, which I liked - about 1100 people signed up, the course wove through some very pretty neighborhoods, and we ran over a very long, fairly steep bridge not once, but twice. The race had a later start time - 8AM! - which I worried about, but it ended up being fine. The day was very overcast and a bit rainy, and it was easier to maintain my pace without the sun beating down on us. As we toed the start line, I told myself that this race was just for fun, no pressure. I set my PR (1:56:28) less than a month earlier, so my goal for Oak Island was to enjoy a new-to-me-race and take in the sights. Of course, once we started running that all went out the window. I wanted to finish in less than two hours, which is always my not-so-secret goal, so I found the 2:00 pace group and told myself I would hold on as long as I could, one mile at a time. I'm really proud that I kept my pace so consistent (though honestly that was thanks to the pace group leader - she was awesome!) with the exception of mile 9. Thank goodness for Gu! As for my training partners, Katie finished less than a minute before me and Nathan ran a 1:49, which is awesome. Not a PR for him, but better than last month's race by a full five minutes, so he was happy. All in all, a great morning and a fun race. I'll definitely be back next year. In the meantime, I'm pretty much done racing for the season. I always get to the point immediately after (or, let's face it, just before a race) when I long to do something different for fitness. I want to start weight training again, but I need to figure out a new routine since the YMCA is still operating on skeleton hours after the fire earlier this year and I'm currently between yoga studios. In the meantime, I'm going to enjoy a few lazy Sunday mornings drinking coffee in my bathrobe. I've earned it.